Manufactured from high grade stainless steel our needles undergo a rigorous quality control procedure to ensure a high standard of sharpness, rigidity, durability and presentation. Needles are hand honed for added sharpness to ensure a smooth, less traumatic passage through tissue. We have ensured that all the products manufactured by Barber of Sheffield undergo a series of thorough quality control checks. This helps to guarantee that all of the needles produced are created to our premium standards including closely examining the levels of sharpness, rigidity, durability and overall presentation of the product. All of our professional grade needles are honed and finished by hand. Not only does the increase the sharpness of the product, it also ensures that the needles have a smooth passage through tissue when they are used. This process also helps to reduce the levels of trauma caused to the surrounding area. In addition to the standard and post mortem range Barber offer a range of special needles such as drilled end, channel and micro needles. Eyed needles can be offered in regular or french/open/spring Eye and in conventional cutting as well as reverse cutting. Round bodied needles taper gradually to a point whereas triangular bodies have cutting edges along three sides. Conventional cutting needles have the cutting edge on the inside of the needle curvature and hence directed towards the wound. Suture tension is therefore at the top of the triangular part of the needle and tear resistance is weak. Reverse cutting needles have the cutting edge on the outside and the flat surface toward the wound and this may offer better resistance against tissue wear. Reverse cutting needles however, do require more force to penetrate the tissue. Here are Barber of Sheffield we understand that the standard options are not always suitable when it comes to needles. That’s why we have a wide and varied selection of products to offer our customers. As well as the most popular regulation products and post mortem lines, we have a variety of specialist needles. These include drilled end, channel and micro needles. In addition to this, we have eyed needles in regular, French, open and spring eye options. 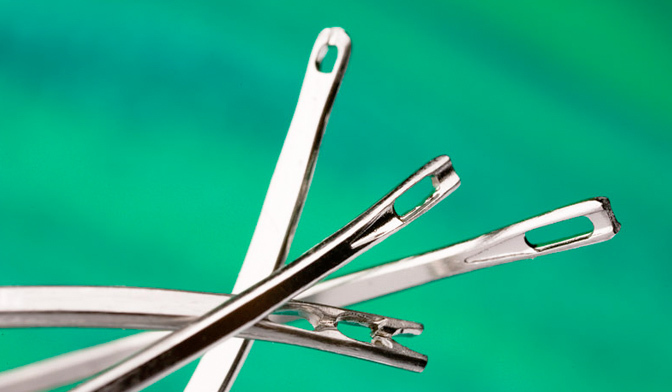 Whether you need conventional cutting or reverse cutting needles, we have it covered in our product range. We also have round bodied needles that gradually taper to a narrow point. Triangle bodied needles have three cutting edges along their modern and simplistic design. Conventional and standard needles have the cutting edge on the inside curved surface of the needle. This placement of the bladed section is deliberately on the curvature so it is directed towards the wound. Reverse cutting needles are the opposite equivalent of this, with the cutting edge located on the outer flat edge towards the wound. This can sometimes offer better resistance against tissue wear, making them a more popular and effective choice. Despite this, reverse cutting needles can require a higher degree of force to fully penetrate the tissue involved. The suture tension is located at the top triangular section of the needle, making tear resistance weak. We can also supply DIN standard needles of heavier gauges if required.